Former Chelsea manager Antonio Conte wants some ambitious transfers if he ends up taking over from Julen Lopetegui as Real Madrid manager. The Italian tactician has been out of work since leaving Stamford Bridge in the summer, with Maurizio Sarri replacing him after last season’s poor performances. Conte remains in demand, however, with Don Balon claiming he’s emerging as the prime candidate to replace the struggling Lopetegui at the Bernabeu. So much so, that it seems the Premier League winner is already drawing up a list of targets, with some huge names on his agenda if he does end up making the move to the Spanish capital. 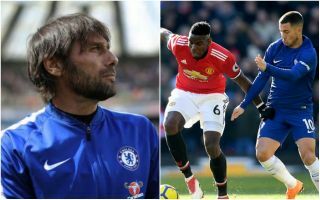 Don Balon claim Conte wants two former players of his from Chelsea – defenders Marcos Alonso and Andreas Christensen, as well as Manchester United midfielder Paul Pogba, and Tottenham striker Harry Kane. This would certainly transform Madrid’s fortunes after a disappointing start to the 2018/19 campaign, with the club looking in need of a big shake-up. Conte would surely be an upgrade on Lopetegui and these players would help the team cope with the summer sale of Cristiano Ronaldo. Marcos Alonso to follow Antonio Conte to Real Madrid? Alonso and Christensen were regulars for Chelsea under Conte last term and among his most impressive performers, while Pogba has blown hot and cold for United but is generally regarded as a world class player in the making, provided he plays in the right team. The Frenchman shone under Conte at Juventus when they were there together a few years ago, so a reunion in La Liga could be ideal for both of them. Finally, Kane is one of the finest finishers in the game at the moment and an obvious upgrade on Karim Benzema at centre-forward.